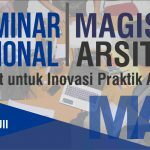 Architecture Department UII is one of the best architecture schools in Indonesia. Opened initially in 1987 and numerously received high level of accreditation by Indonesian Ministry of Higher Education and Research. 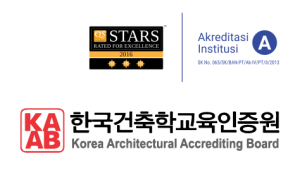 This department, altogether with Professional Program of Architect (5th year professional program), with 4+1 scheme, has received international accreditation by Korea Architectural Accrediting Board (KAAB) (http://www.eng.kaab.or.kr) for 2017-2020 period. KAAB is one of signatories of Canberra Accord, a document signed by seven accreditation/validation agencies in architectural education including AIA(Australia), CACB(Canada), NBAA(China), CAA(UK), ANPADEH(Mexico), and NAAB(US) (http://www.canberraaccord.org). The international recognition within international accreditation has been received by the department by implementing international standard of architectural education. Student Performance Criteria from KAAB has been adopted for the curriculum since 2013. Architectural education facilities were fulfilled, optimized, and dedicated for the benefit of the students, staffs, and users. The 5th year program as final steps for professional degree was initially open and run by 2012. 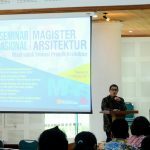 This 4+1 scheme is not only giving professional degree, but also within IAI scheme giving license (Indonesia: Sertifikat Keahlian Arsitek-SKA) as young architect. All this achievements, up to now (2018), making the department as the only program giving professional degree and certificate in Indonesia. The international accreditation has increased the quality of teaching and research in the department. Students are free to use the facilities in the department for 24 hours including studios, laboratories, information center, and workshop rooms. Each student is also has her or his own space in so called Fixed Studio since 3th semester to 10th semester. The department is also launched International Class (IC) for international student since 2017. Since 2017, the Master of Architecture program was also opened and immediately followed by a numerous students. All these programs and facilities ensure the quality of the department. As a department with international recognition, we are also has many collaboration with international and national partners for students and staffs exchange, summer school, and other activities such as architectural excursion, field study etc. The staffs and students are eager to seek collaboration and multidisciplinary works both from academic and professional partners.